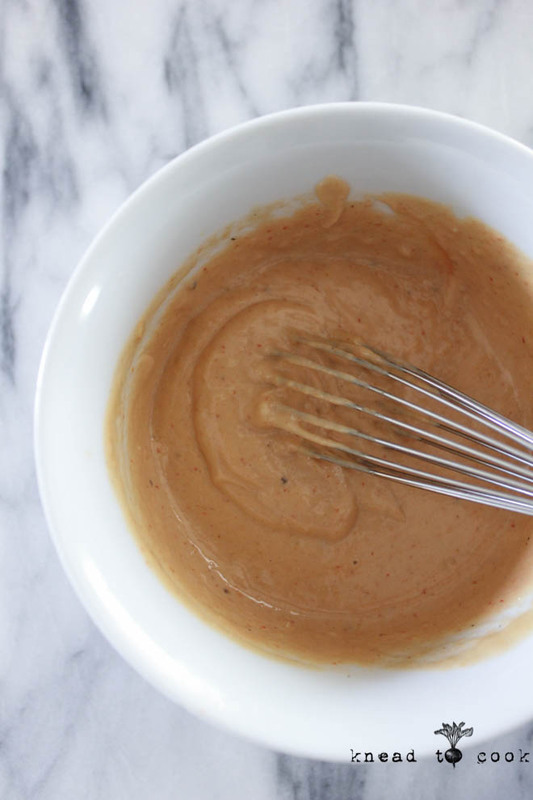 Add all of your dressing ingredients and whisk together. Taste test and adjust seasoning. Whatever veggies you wish to add are all perfect. Remove the hard spine. Tear into bite sized pieces and wash/spin to dry in your salad spinner. 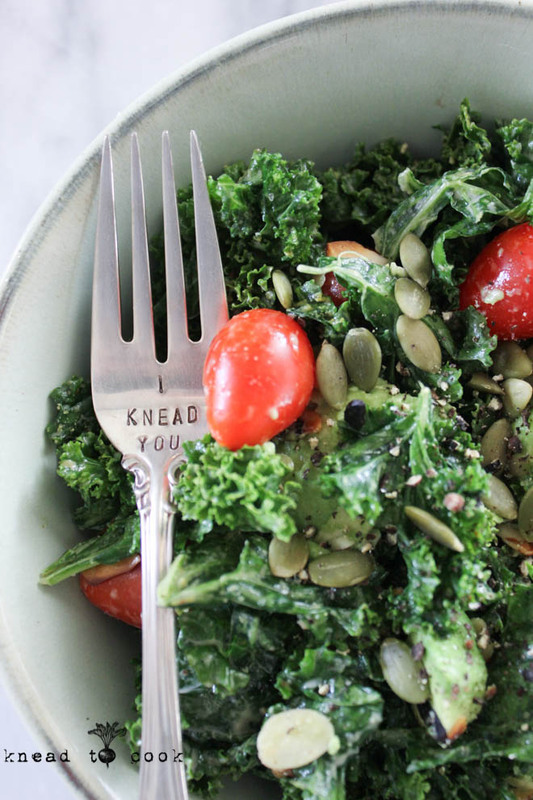 To wilt the kale down, making it more palatable and not as tough to eat – Add about 1 heaping tablespoon of the dressing or a little more to the bowl of kale. With washed hands, get in there and massage the leaves for about 2 minutes. 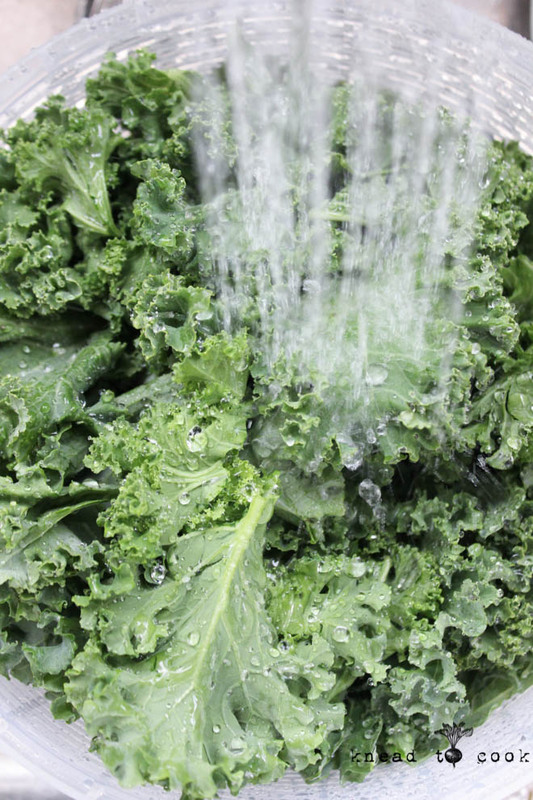 The dressing will help to wilt the kale down making it not a tough to eat. 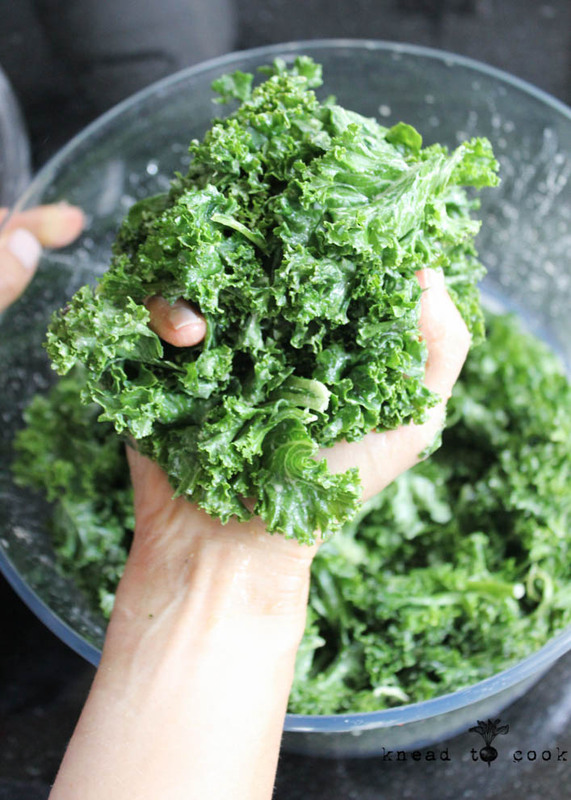 Once the greens are wilted, add your additional ingredients. Serve and enjoy! 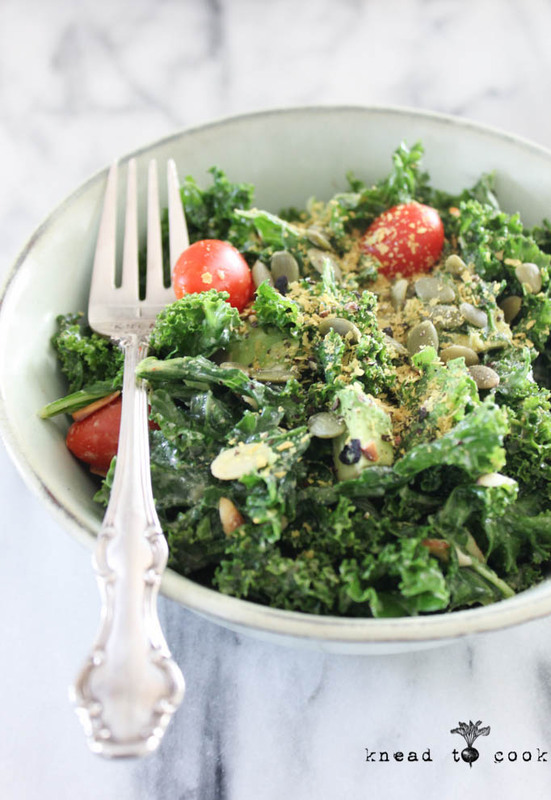 Nutritional yeast adds a nice cheesy flavor to the salad. Nutritional yeast boasts a whopping 8 grams of protein in 2 tablespoons, which is the same amount found in 1/2 cup of most types of beans and legumes. It’s also only 45 calories per 2 tablespoons, making it one of the lowest calorie sources of protein out there. I do prefer Bragg’s which is sold in most grocery stores. Nutritional yeast contains 4 grams of fiber in just 2 tablespoons, which is equivalent to 1/3 cup oatmeal & 1/2 cup broccoli. Nutritional yeast is a good source of several minerals that also contribute to healthy blood sugar, including magnesium and zinc. 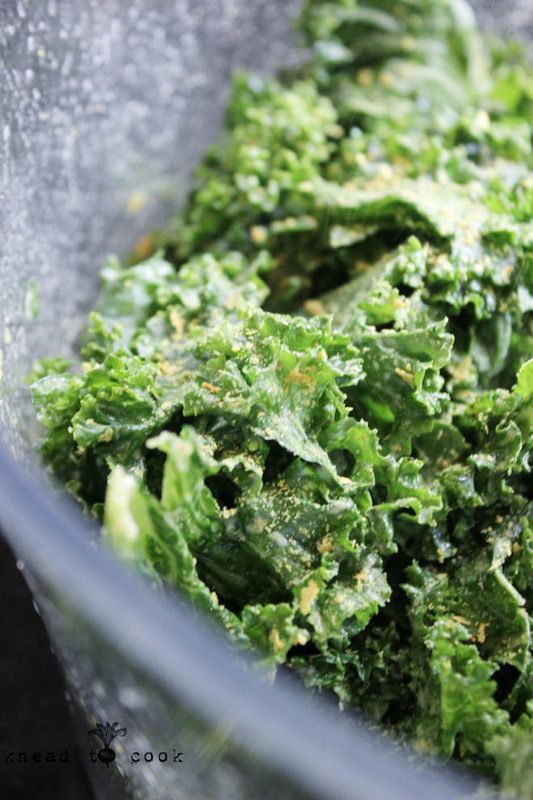 The most well-known benefits of nutritional yeast is its wealthy stores of B vitamins. Two tablespoons of nutritional yeast contains: 9.6 milligrams of Thiamin (640 percent) , 9.7 milligrams of Riboflavin (570 percent), 56 milligrams of Niacin (280 percent), 9.6 milligrams of Vitamin B6 (480 percent), 240 micrograms of Folate (60 percent), 1 milligrams of Pantheonic Acid (10 percent), and 7.8 micrograms of Vitamin B12 (130 percent). This salad stores well but you may need to add additional dressing to it. Tapering continues. Pretty much all I need to say on that subject. Fueling. Resting. Rolling… a lot.